Austin Police Department Chief Art Acevedo has accepted a job as Houston’s police chief, a source told the Austin American-Statesman on Thursday. Austin Police Department Chief Art Acevedo has accepted a job as Houston’s police chief, he confirmed Thursday from Houston. Acevedo publicly accepted an offer from Houston Mayor Sylvester Turner, saying he "looked forward to the challenge" during a press conference. "I believe the timing is right for me to take on the opportunity to work for Mayor Turner and lead the men and women of the Houston Police Department and serve the people of Houston," he said in a statement. During the press conference, Turner also announced the city of Houston would be hiring El Paso Fire Chief Sam Peña. "You know, I'm excited for this day," Turner said. "I was so excited, I couldn't get to bed last night." Austin Mayor Steve Adler released a statement that confirmed Acevedo's move after it was first reported by the Austin American-Statesman on Thursday morning. The move makes Acevedo head of the nation’s fifth-largest police department. Acevedo has served as chief of Austin’s 2,300-member department since 2007. He's faced some internal disagreements in the department after being outspoken against police brutality. 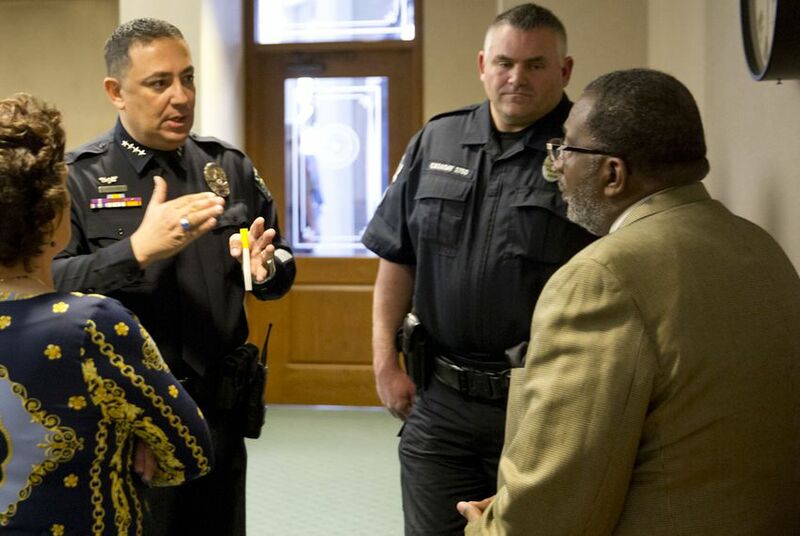 In April, Acevedo was docked five days’ of pay by then-City Manager Marc Ott when he did not follow orders to stop discussing the police shooting of an unarmed, naked Pflugerville-area high school student in February. In October, the Statesman released a secret recording, which further revealed the department’s inner struggles. In the recording, Acevedo used emotional language and profanity while condemning two high-profile police shootings to his commanders. Acevedo has also been outspoken against U.S. Immigration and Customs Enforcement's detainer program — the process by which the agency asks local jails to hold potentially deportable inmates so the agency can come pick them up. Some critics have described Austin as a “sanctuary city" — a term used broadly to describe cities that refuse to enforce federal immigration laws. The police chief tweeted Wednesday that the city is "lumped into this category despite the facts." Disclosure: Steve Adler has been a financial supporter of The Texas Tribune and is a former Tribune board member. A complete list of Tribune donors and sponsors can be viewed here.